Microsoft Remote Desktop allows you to control your computer over a distance, from various devices. The application comes with a few interesting and useful features, which make it stand out next to other remote control utilities. For example, Microsoft Remote Desktop can give you direct access to a computer's resources, through a Remote Desktop Gateway. It is available for the latest Windows versions, for all popular Mac OS X systems and for Android and iOS devices. 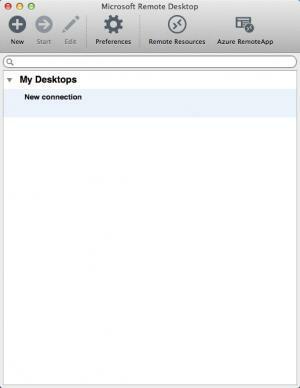 The application's compact and clean interface presents a blank list, to which you can add remote desktops and resources. Creating a new connection requires filling in a series of input fields on a separate window. You will need to know the host's name or IP address, your domain or user name and password and a few other details. Once your connections are listed, you only need to click one and hit the Start button above the list. This will connect your Mac to the specified PC right away and you will be able to control it as if you were right in front of it. The application lets you access a remote computer's resources, through a Remote Desktop Gateway and through the Azure Remote App. In other words, you can access programs, files or connected peripherals from the host computer directly, without starting a traditional remote controls session. Making use of a PC from a distance can be as easy and convenient as possible when using Microsoft Remote Desktop. 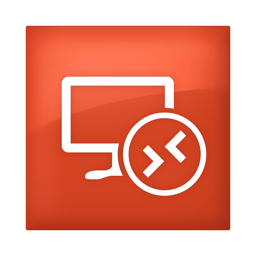 The application lets you connect to remote PCs from various devices. You may control the PC as if you were right in front of it. It is also possible to access specific resources on that machine. You won't find Microsoft Remote Desktop for older Windows versions, like Vista or Seven. You can download Microsoft Remote Desktop free here.